A stronger-than-expected third-quarter earnings report gave some investors good reasons to buy. Strong Ram pickup sales helped boost FCA's profit margin in North America last quarter. Image source: Fiat Chrysler Automobiles. Shares of Italian-American automaker Fiat Chrysler Automobiles N.V. (NYSE:FCAU) surged in October. After closing at just $6.40 on the last day of September, shares surged to $7.32 at the end of the day on Oct. 31 -- a gain of almost 14.4% for the month. 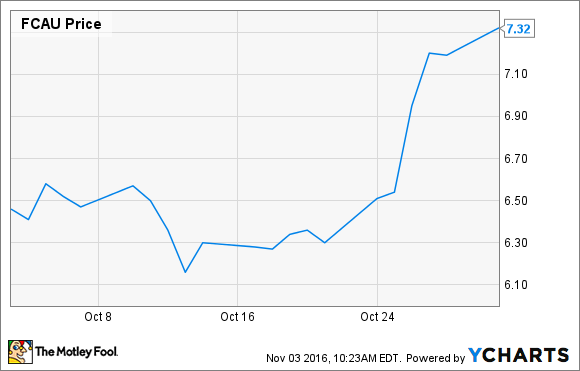 As we can see from this chart, the shares really started to climb on Oct. 25, when FCA reported its third-quarter earnings result. FCA's earnings report included several pieces of good news for investors. FCA's adjusted pre-tax profit of 1.5 billion euros ($1.66 billion) beat analysts' estimate of 1.4 billion euros. The company raised its full-year guidance for revenue, pre-tax profit, and net profit. The pre-tax profit margin in FCA's North America unit rose to 7.6% from 6.7% a year ago. That's still far behind General Motors' 11.2% margin, but it represents good progress on a metric that's very important to investors. The company posted strong pre-tax profit of 104 million euros in Europe, on sales gains that outpaced the industry's growth. It reported a 52% year-over-year increase in sales in China, where SUV demand is high and FCA has begun producing Jeeps locally. FCA's stock is still a riskier bet than many of its global rivals. The company had a sobering 25.3 billion euros of debt as of Sept. 30, its ambitious five-year product-overhaul plan is behind schedule, and FCA appears to lag the industry in the development and adoption of advanced technology. But if it can sustain this recent progress amid signs that the U.S. new-car market is softening, the investors who jumped in after its earnings report could be rewarded.